Huge Congratulations to Ellen who passed her Driving Test after having Driving Lessons in Torquay with The Driving School sw. 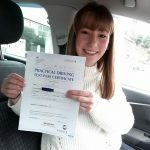 It was a fantastic achievement considering the the way the Driving Lessons had to be crammed into short periods of time with huge monthly gaps in between. Well done and wish you great success in your career too. Take care and stay safe on the road.